This brief summary will give you a simple overview of the key points you need to know in order to understand your Terrain Analysis Report. However, if you wish to truly understand the Ten Terrains Model, we advise you to read the book 'Introducing The Ten Terrains Of Consciousness'. There are 10 Terrains in total. The Ten Terrains span a Continuum of awareness from the Matter-Based Terrain (Particle) to the Void-Based Terrain (No-Thing). The Continuum Of Terrains is not like ten steps upon a ladder. It is like ten concentric rings, each with a more expanded awareness than the one inside it. Moving along the Continuum Of Terrains from Particle towards No-Thing, perception slowly expands by degree from Separation to Unity. 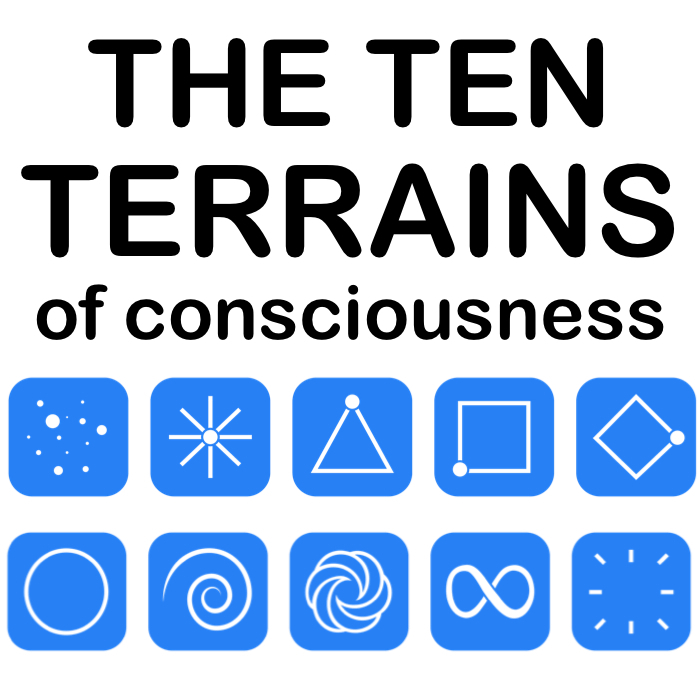 Every person in our world is living at one of these 10 Terrains Of Consciousness. Some people are at the same Terrain as you, and others are at a different Terrain. Your Terrain of Consciousness is like your core operating system. It is underneath all your programs. It is running you. Don’t worry if you aren’t aware of it running you. It is running in the background, just like the operating system in your computer. Indeed, most people can’t see their own Terrain Of Consciousness, just like a fish can’t see the water it is swimming in. The perception of reality that you have at your current Terrain creates your thoughts, your beliefs and your values. It drives your choices, your actions and your behavior. It underlies your worldview and your entire paradigm. It is the invisible foundation beneath your life. In fact, your Terrain is so central to your perception that it is almost like a pair of colored glasses that you are wearing. It colors everything you are seeing. Each Terrain is completely different. Even if you are in the same room as a person at a different Terrain, it is as if you are each living in a completely different reality, or in a parallel universe. You each see and experience the world in a completely different way. You see the world from the perspective of your Terrain and through the filters of your Terrain. They see the world from the perspective of their Terrain and through the filters of their Terrain. Basically, it is as if people at the other nine Terrains are wearing different colored glasses to you, which makes them see the world totally differently than you do. A simple way to think of the Ten Terrains is like a train journey through 10 different geographical regions. Right now you are experiencing the part of the journey that roams through your particular region. ​For example, let's say you are at the Reflection-Based Terrain (Diamond). This means you are currently traveling through the Diamond countryside. You might be someone who has recently crossed the border into the Diamond region from the previous region (Square). You might be someone who has been travelling through the Diamond countryside for many years and is well settled here. Or you might be someone who is close to the end of their journey through this region and is approaching the borders of the next region (Circle). ​The words in your Terrain Analysis Report will strike you differently depending upon where exactly you are at along this journey through your particular region. It is important to understand that your Terrain is not who you are, it is where you are in your evolutionary journey at this moment in time. For example, if the Terrain Analysis Questionnaire found that you are at the Order-Based Terrain, you are not ‘a’ Square, you are ‘at’ Square. Your Terrain is not your identity, it is simply a stage you are passing through. While you are at this stage, you see the world through the lens of this Terrain. It is your current relationship with reality, which creates all your current values and behaviors. Earlier in your life, you may have been at a different Terrain, and later in your life you may be at a different Terrain. But for now, you are at the Square stage in your spiritual journey. Every person on this planet is at one Terrain, and only one Terrain. Just as you cannot simultaneously be 10 years old and 11 years old, neither can you be at more than one Terrain at the same time. For example, if you answers in the Terrain Analysis Questionnaire revealed that at this point in your life you are at the Connection-Based Terrain, this means that you are at Circle and only at Circle. Your Terrain is not a mix of Circle and Spiral, or Circle and Toroid. You are not ‘partly’ Circle and ‘partly’ something else. You are at Circle. Even if you are moving towards Spiral and starting to be drawn to the lessons and teachings of that Terrain, you are still at Circle. It is important to remember that all 10 Terrains are of equal value. Each Terrain is an important journey of evolution. Each Terrain brings with it crucial gifts, experiences, lessons and challenges. The lessons of your Terrain are powerful ones that no Being would want to skip—nor can they. So make the most of your time here at this Terrain! Being at your Terrain does not make you any better or worse than someone at a different Terrain. It does not make you smarter, more evolved or closer to the ‘finish line’ than anyone else. Nor does it make you less evolved or less enlightened than anyone else. Just like it is not any better to be 25 years old than 15 years old, it is not any better to be at Spiral than at Diamond. No one Terrain is better than any other—each is its own unique journey. Although your unique ‘geometry’ in this lifetime is generally fixed—such as your body type, personality type, innate talents, energetic signature, life purpose, etc.—your Terrain Of Consciousness is not. As you grow and expand and your awareness broadens, your Terrain can shift. Some people will stay at the same Terrain their entire life and other people will shift Terrain once, twice or more. Everyone’s journey through the Continuum of Terrains is different. And everyone’s journey is right for them. A Terrain Shift is monumental, for it changes everything in a person’s life: the way they see the world, the choices they make, the people they are drawn to, the work they do, their very relationship to reality. Some people's whole world falls apart when they jump Terrains. Nothing seems to fit them anymore - not their work, their friends, their life... It is huge! Whatever Terrain of Consciousness you are at right now, either you started out your life at this Terrain or you shifted here from the previous Terrain at some point during your life. Indeed, you may have shifted through several Terrains over the course of your life. ​If you have shifted Terrain during your life then learning about this shift will explain a lot of things that you have experienced. It will explain why you now see the world so differently than you used to, and why you are living a very different life now. The Continuum of Terrains is evolutionary. So there is a possibility that at some point in the future you may shift to the next Terrain on the Continuum. What must be understood is that you cannot make that shift happen by intention or force of will; it will only happen when you have learned all the lessons you are here to learn at your current Terrain, had all the experiences you need to have here at your current Terrain, and made the contribution you are here to make at your current Terrain, and it will only happen if your greater Infinite Self wishes you to shift there. The journey from one Terrain to the next is like traveling from a valley up a mountain and down the other side to a new valley never seen before. This journey can takes years, decades or even lifetimes! A person who is in the 'Mastering Phase' of their Terrain is deeply exploring the valley that they are currently living in. 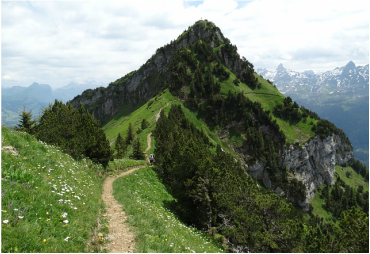 A person who is in the 'Transitioning Phase' of their Terrain is hiking up and over the mountain towards the next valley. ​We explain what it means to be in the Mastering Phase and in the Transitioning Phase in your Terrain Analysis Report. For now, know that both of these Evolutionary Phases at your Terrain—Mastering and Transitioning—are equally valuable and both bring great learning and great gifts! ​Some people spend their entire life at one Terrain... Some people shift Terrain once or twice in their life... And others expand through multiple Terrains in one lifetime. This is because we are each here with a different 'Evolutionary Role'. Some of us are here to hold the Field stable and others are here to shift the Field. Neither role is better, they are just different. It is important to note that—within your current lifetime--you cannot move backwards to a Terrain with a less expanded perception of reality. That is, you cannot regress in your spiritual evolution. Just like you cannot go from being 18 years old to 17 years old, there is nothing that can happen to you that can cause you to shift in this lifetime backwards to the previous Terrain. This is because, as the wise saying goes, “Once you become aware, you can’t become unaware”. ​Of course, you may exhibit regressive behavior, but your core relationship with reality does not go backwards. For example, if you are at the Order-Based Terrain (Square) you might strike out in anger when your buttons get pushed, but that does not mean that you have suddenly jumped back to the Will-Based Terrain (Pyramid). You are still at Square and therefore you remain a sensible person committed to the greater good, and you can make the choice to bring yourself back into a calm state. As a person moves along the Continuum Of Terrains, their perception of Consciousness expands exponentially; that is, it increases by a greater amount at each Terrain. For example, if you are at Spiral now, you have a more expanded perception of reality than do people at Circle. If you one day shift to Toroid, you will then have an even more expanded perception of reality then than you do now. Again, this does not make you any better or worse, it just means you are looking at the reality of Infinite Consciousness through a wider pair of glasses. In addition, as a person moves along the Continuum, the shifts in perception between the Terrains themselves become exponentially more subtle. It is important that we point out a common misunderstanding about the Ten Terrains. Because the human mind from the perspective of the ego can only perceive in time, the Continuum of Terrains appears to be linear from one end to the other, much like ‘train stops’ along a journey. And indeed, we often use this linear metaphor to explain the Continuum of Terrains, as it helps people to grasp the basics of the Ten Terrains Model. However, from the perspective of the Infinite Self there is no journey of evolution at all, there is only ever this one ‘Now’ moment, and everything we are experiencing is a holographic projection created by the sum total of all our charge force. Therefore in the truest, deepest understanding of the Ten Terrains Model, you are where you are at right now because everything you are and everything you have ever been is causing you to be here. The bottom line is, you are meant to be at your current Terrain right now, and there is no need for you to strive or strain to try to be anywhere else. It is not only individual people who have a Terrain of Consciousness. Because our universe is fractal in nature, groups of people—such as families, communities, organizations, etc.—also have a Terrain of Consciousness. Indeed, every culture and civilization also has a Terrain. This is known as the 'Prevailing Terrain' of the day. It shapes life in that civilization—at a social, economic, political and cultural level. The Prevailing Terrain of a group or country can shift as that culture grows and evolves, just like a person’s individual Terrain can shift. At this point in time, the ‘Prevailing Terrain’ in most Western countries is either the Order-Based Terrain (Square) or the Reflection-Based Terrain (Diamond). To find out the Prevailing Terrains of the Developed-World, the Developing World, and the entire world as a whole, we invite you to read the book 'Introducing The Ten Terrains Of Consciousness'.